Robert (Bob) Sutton was born in Bury in 1885, the son of John and Mary Sutton. However by the time of the 1901 Census the family were living in Ritherup Lane, Rainhill. Still at this address in 1911, Bob’s occupation was given as a clerk in the Electric Wire Works (BICC). Robert had a step-brother Joseph Cuthbert Sutton. 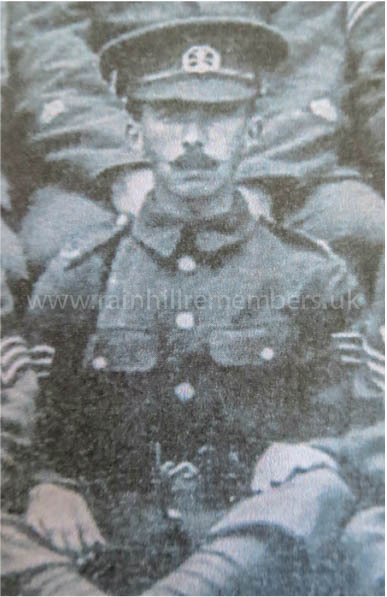 Due possibly to the experience gained with this Regiment, he was rapidly promoted, first to Corporal on 18th September 1914, then Lance Sergeant on 10th October 1914 and finally to full Sergeant, 20294 on 23rd October 1914. Bob was with his Regiment in England for just over a year before being shipped to France on 6th November 1915. On the 10th November, he was “slightly” injured but still able to carry out his duties although by this time (January 1916) records show that he had reverted to Corporal at his own request (apparently this was not uncommon, he probably thought a Sergeant's life was not for him). His Battalion was in action as part of the latter stages of the Somme campaign carrying out “Pioneer” work such as building bridges, roads, ditches etc. It is not recorded exactly when, but Bob received injuries to his right thigh and left arm after coming under attack from artillery and mortar fire. He was taken to No. 11 General Hospital probably close to Boulogne some distance from the front and the location of several large hospitals. Despite the hospital's best efforts, he died suddenly on 28th October 1916, aged 30. The Matron of the hospital said, “He was such a splendid patient always cheerful and making the best of everything, I cannot tell you how sorry we are”. A Sister serving at the same hospital said, “We were sorry to lose him as he was such a good and cheerful patient. He died rather suddenly, the cause being severe haemorrhage from the thigh wound". To see the 'Death Penny' which was sent to Robert's family visit Keep the Home Fires Burning.